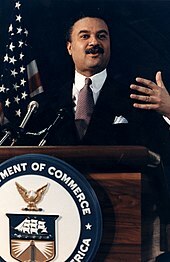 President Clinton then appointed Brown to the position of Secretary of Commerce in 1993. Clinton's highest priority was bolstering the economy, not diplomacy, and Brown produced results. He led delegations of entrepreneurs, businessmen and financiers to South Africa, Mexico, Saudi Arabia, Jordan, Israel, the West Bank, Gaza, Egypt, Russia, Brazil, Argentina, Chile, China, Hong Kong, Ireland India and Senegal. He was leading a trade mission en route to Yugoslavia when all passengers died in a plane crash. ^ Shirley Anne Warshaw, The Clinton Years (2009), pp. 49-50. This page was last edited on 20 April 2019, at 13:47 (UTC).